Because I have some financial pressures squeezing ever tighter, I designed this flyer to promote my massage therapy business. I showed it to several people for their reactions, and got one or both of these comments from every one of them: What table? and Take the text off the image of the table you’re referring to, and move it into the empty spot at the top right. Clearly it wasn’t an effective flyer. But the idea of putting the text in what I’d intended as open, clear, negative space irked me to no end. The whole point was to show expansive, uncluttered space, like your mind when you really relax. Some people are compelled to fill every hole. Maybe I should put big arrows pointing out: This is the table you will lie on. And, This emptiness is your mind during a massage. The fact that I couldn’t communicate this idea to people who already know me, and know massage, discouraged me, and I set the flyer aside to move on to other efforts at promotion (which, incidentally, failed more pathetically than the flyer). That was several months ago, and last week I was making a feeble attempt at decluttering the office, when this flyer rose to the top of the pile. My daughters found it and started asking questions about it. Why hadn’t I ever done anything with it? I told them that it wasn’t effective, and they agreed. They had been among those who originally critiqued it, after all. But I kept coming back to my irritation. Some people think they have to put something in every unoccupied space. If there’s a corner, they have to stick something in it. If there’s space on a shelf, they have to put something on it. (My own house has a dearth of horizontal surfaces unfilled with crap.) If there’s an open minute, they have to do something. Why can’t people just allow what is to be? But upon further reflection, it isn’t that people do these things that is bothersome. As my twelve-year-old pointed out, some people function well that way, and they get a lot done. She suggested there is a balance to be found. She’s right. Maybe I should be more like them. I get very little done, and have no excuse when I don’t know what I did at the end of a day, or a week. Maybe I should try harder, push myself a little more. Truly, though, I know that isn’t the answer. It doesn’t make me more effective, it just makes me unhappy. I don’t know why pushing doesn’t get things done for me, but it’s always been the case. Hence the ineffective flyer and the hours I spent designing it. Hence the promotional efforts I made after that, which took more hours and also came to nothing. I wanted to will a busy practice into being, but that’s never worked for me. Rather, I usually look back and it looks like I got what I needed, if not what I thought I wanted, and it didn’t come through effort but through allowing, choosing with intention, and accepting with gratitude what came to me. Why do I say I should be more like someone else? I know it’s not true. I imagine people thinking I should be busier, try harder, adopt a better work ethic. They often ask me, “How is massage going? Keeping busy?” It’s what the Midwest is all about: the highest and most frequent praise people speak of anyone else is He works really hard. If I’m honest, though, I can’t think of anyone ever telling me directly that I should be different in any way. It could all be my imagination. It comes from me. I had a vision of how things could be, of expansiveness and light, uncluttered and free of expectation, thought, or intention. Another name for this is peace. I could share that with others, but instead of receiving it, they mirrored back to me my own excess thinking, expectations, judgements, and willfulness. Isn’t it always that way, with the things that bother us most? Those are the things we don’t want to see about ourselves, that we try to push away, that keep coming back to gnaw at us until we pay attention. Hello old friend, Shadow. I don’t know how I’m going to manage my debts. I may or may not expand my business. I will not be presented the highest praise bestowed in the Midwest. There is another statement, though, which describes me; it has yet to be elucidated. It is something about self-knowledge, higher understanding, effortless balance, peace. When I get there, I will know, and I won’t need other people to tell me. The kids are back in school, and I have whole mornings in front of me, days at a time, so I’ve been spending more time at the computer, but I’m not finding in myself the slightest desire to write. The book is done (except for that one tiny little thing, and the one tiny little thing I’ll think of as soon as I do the previous one tiny little thing), and I’ve been doing the (not) surprisingly time-consuming tasks one must do when self-publishing. But I’d hate to for you all to go without something to read for yet another weekend, so here’s a little something I’d been meaning to put up one of these days. I wrote it several years ago to submit to some free magazine who never replied, and though it’s not my most searing truth in this present moment, I can’t find anything I disagree with. I should note that my mom has been gone now for almost three years. She was obviously still living when I wrote this. 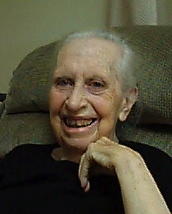 Leona Creager, at the nursing home where she lived her last few years. My mom has Alzheimer’s disease. She’s had it for many years, starting long before we even suspected a problem. It began with forgetting the names of people she didn’t like. She did that for years, while functioning otherwise as a very normal, capable, highly intelligent and organized person. Then it was names of anyone, including people she did like, tasks she didn’t want to do, tasks she intended to do whether she wanted to do them or not, and it went on from there. For a long time she could cover quite skillfully. She was probably doing it longer than we thought. She could rationalize any strange thought, make polite conversation by asking questions of a person, fabricate entire stories about a past no one really could verify anyway. Sometimes she had an uncanny knack of giving me the advice I needed to hear, as if our mother-daughter roles had not come to a reversal, as if she had any idea what she was even talking about. One time I went to her house, troubled about I don’t even remember what now, and out of nowhere she said, “I used to think that I needed to be what other people wanted me to be, then I learned that I just need to be what I want to be.” It was startlingly applicable to the moment. And this is how this disease works. Like a moth-damaged sweater, barely perceptible holes grow until you can put a finger through, then you notice more holes, then the fibers lose all integrity and the whole thing falls apart. Along the way, there’s this interminable period of dissipation. Memories disappear, vocabulary disappears, the conceptual framework that one uses to define one’s world disappears. For many people with Alzheimer’s, there’s a period of anxiety and paranoia. Some spend entire days looking for things, without any idea what it is that’s missing. Some think people are stealing from them. My mom would go on long rants about my brother’s wife’s father, or about a colleague of my Dad’s at a University where he was a professor forty years ago. I’m sure this is a result of losing one’s mind, literally, but I also can’t help but think that, for my mom, it is an old habit revealed, like the bedrock left after vegetation dies and topsoil washes away. She was a critical thinker, exceptionally skilled, even wise, at seeing through people’s motives. She had worked in advertising, and would automatically point out whose interests were served by any ad she saw. So, to me, it appeared that as other aspects of her personality dissolved away, what was left was paranoia. Watching this process, I wonder, what of me will be revealed as the landscape of my mind erodes away? Who will I be, when I can no longer remember my name? What habits am I quietly cultivating today that will scream out their presence in the absence of personality? Let’s assume we have a choice. There was a period when I used to think, if I practice it a lot now, when I’m losing it I can slip into an obscenely vulgar ditty I heard on a cassette tape my husband bought at a truck stop once. That’s just my absurd sense of humor. It would be a joke that even I would be too demented to get. Maybe because I’m past forty now, I feel a need to get down to business and pick something real. What idea or concept is worth making so much a part of my life that it becomes my most enduring nature? If I could choose my last words, what would they be? If I had to distill everything I believe and stand for down to one word, how could that be possible? Is there one word that could speak to any moment, any person, any time? That could stand the test of interpretation? One word that, whatever one might say about it, can, when spoken alone, speak for itself? What one word could I begin today to meditate upon, to repeat to myself before I fall asleep at night, to speak aloud often enough to engrave it upon the bedrock of my being? The only word I ever come up with is PEACE. And boy, do I have a lot of work to do. I better start right now. I’ve been thinking about history, about certain threads that run through the weave of it, not events but rather sorta big ideas, or deep ideas, underlying motives, maybe. It’s about war and how people fight. 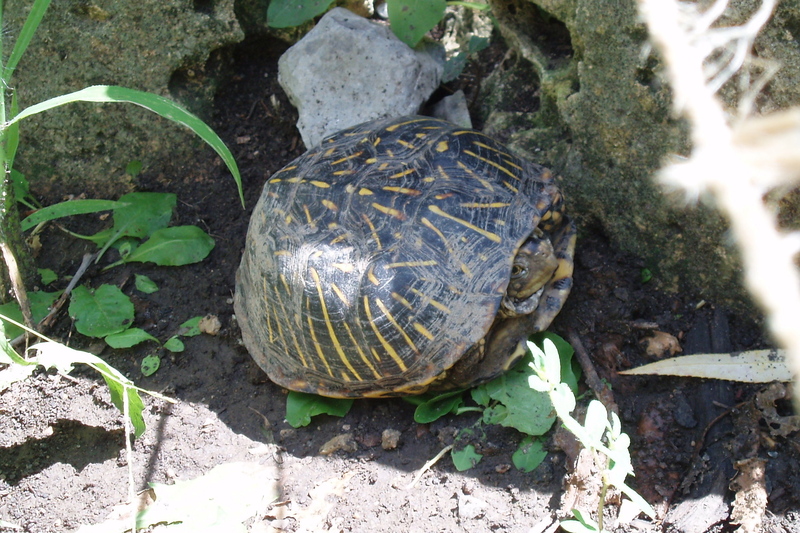 At least the box turtle could get out of some mud, if she wanted to. In the middle ages, much of conflict was based in strong defenses. You placed your castle in a high place where you could see and defend against the enemy. Castles got bigger and more complex and became places where a whole village could hole up for weeks or months, to wait out their enemies within thick stone walls. Conflict on the ground also emphasized defense. Sure, soldiers had ridiculously long lances, and crossbows, but they were wearing so much armor that if they fell off their horses they couldn’t get up. If they fell face down in a mud puddle they’d just drown there. Least that’s what I’ve heard. So you can see the limits of this defensive approach to war and battle. The people in the castle had to wait for their attackers to leave, while the enemy could go round up some friends, or go out for tea, pick up some groceries and a video, grab a beer at the local pub, and come back to the castle refreshed and ready for battle, should the inhabitants finally get tired of sitting inside with nothing to do. (Don’cha like how I work in a reference to the twentieth century?) Because of this problem, castles were eventually abandoned altogether, and the offensive approach to war rose to dominance. Firearms were invented, so people could shoot one another without getting too close. Then tanks, which took the defenses of the castle on the offense. Airplanes were developed to drop bombs and warheads on people from the sky. Biological and chemical weapons took advantage of the physical vulnerabilities inherent in the human body. By the beginning of the twenty-first century, offensive attacks were so sophisticated that a man could sit in a comfortable office and with a few keystrokes send unmanned craft over oceans and continents to target a particular person or place and destroy it/him/her. They probably never knew what had hit them. Around this time, some people were starting to wonder if any of this was really a good idea after all. They figured they had a choice, to continue on an endless path to nowhere and develop ever-more-sophisticated ways to attack and kill people, or to rethink the whole idea of war and conflict altogether. Maybe getting along was underrated. Did anybody in any of these wars really know what they were fighting for, after all? Sure, everybody likes to talk about freedom, or security, but how free, or secure, is anyone, when drones can find you, anywhere in the world, and kill you in your house while you sleep? So that was the choice people had, in the early twenty-first century. To keep up the good fight, the expensive, dangerous, never-see-the-end-of-it fight, or to figure out how to quit fighting, to find better things to do, to choose cooperation over conflict. To commit to peace. And here I am, at the other end of the century looking back, sitting at what used to be a crossroads in those days, and what did they choose? Well, look at the history, and you tell me.